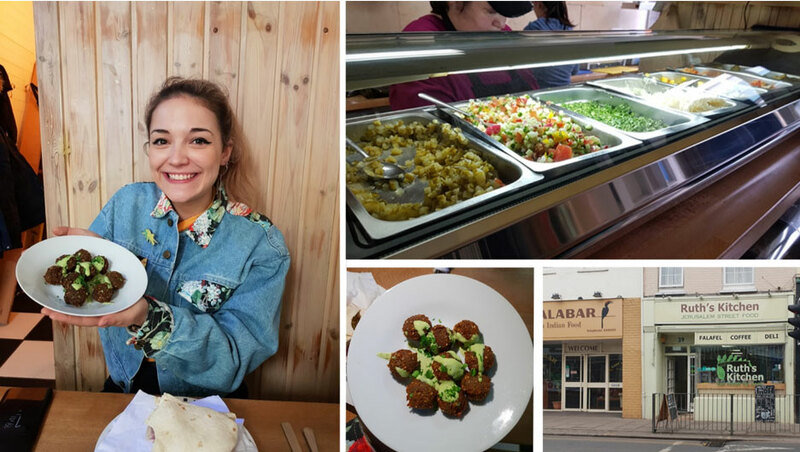 BA (Hons) VFX student Pheya shares her tips for the best places for a student friendly meal in Norwich. Part of being a student is knowing where to find cheap deals. As we are all aware, being a student can be a financial struggle, however you’ll be glad to know that Norwich can accommodate for us students! Staying up late night studying, forgetting to defrost our dinner, slightly hungover, stressed or just simply hungry students. One of my favourite things about Norwich is how many independent small businesses there are, varying from quirky coffee shops, bars and restaurants. In this blog I will review a few of my favourite spots to get a meal in under £10! This is by far my favourite location to eat in Norwich. Ruth’s Kitchen (pictured above) serves homemade extremely fresh Jerusalem street food with a warm greeting and a great atmosphere. The best thing, students eat in for free! This is a great location for any dietary requirements, Vegan, allergies, or even just simply a healthy choice. From a variety of falafel to shawarma meat, Ruth’s offers a great price for quality food. If you think you had good falafel before, honestly (not even exaggerating) think twice. My absolute favourite is the falafel wrap for less than 4 quid! The freshly made tahini is actually incredible. You will never feel the same way about supermarket hummus again. For those who eat meat I would also recommend shawarma, or the schnitzel, they update their menu regularly with occasional specials, they are also available on Deliveroo so you can have it delivered to your home! Arguably “the best chips you’ll have”, Grosvenor’s was the first location I ate at in Norwich. I think it pretty much summarises how quirky the city is, an underground fish and chips bar, pretty cool. Located less than 5 minutes away from Uni. Ideal on Friday, a warm summers day or even for a late-night. A cool tip is that they also take orders into The Birdcage, an artsy pub across from Grosvenor’s where you can also go for a few cocktails or an open mic night. 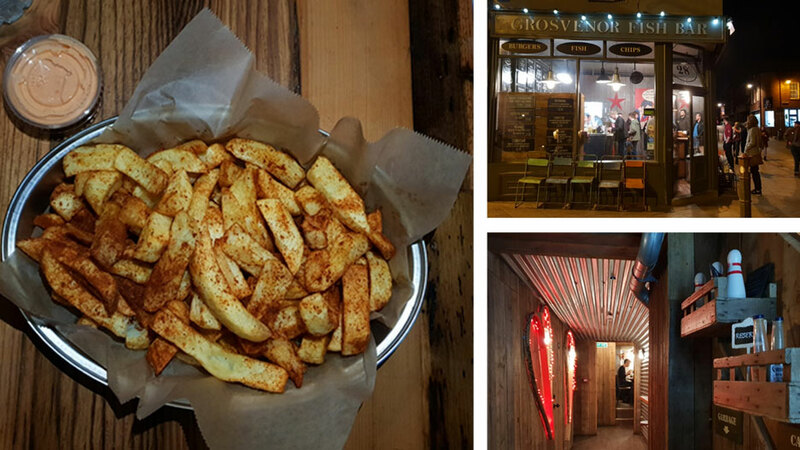 A few of my favourites are the cha-cha chips- a topping with a spicy kick, a cone of chips only for £1.20 for a snack and their own made chilli mayo, a great hangover cure! A convenient location right in the heart of the city less than 10 minutes’ walk from Uni. A great combination of flavours and a variety of Mexican street food. 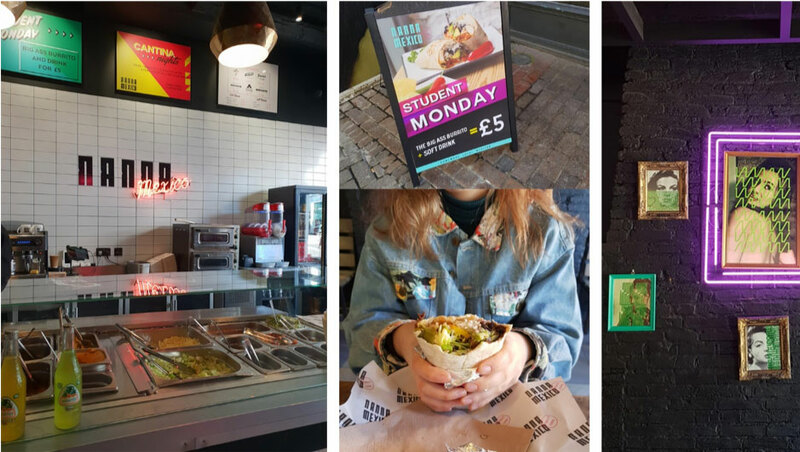 On a Monday, Nanna Mexico offer a student deal, any twelve-inch burrito for a fiver including a drink. One of my favourites parts of the meal is the hot freshly made tomato and jalapeno salsa. It’s a practical, quick (and bonus) healthy lunch. Great atmosphere for siting in and lovely friendly staff. Vegetarian and allergy friendly too!